The United States Navy is attempting to ring fence Africa, and appears to be thinking about the same in the Caribbean, Central and South America. 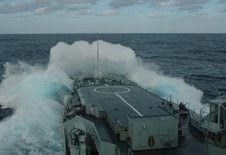 The U.S. Navy has the waters surrounding the African continent covered. Last week, the seafaring service wrapped up a tour by the Navy’s 6th Fleet Southeast Africa Task Force, a three-nation mission with visits to Madagascar, Mauritius and Reunion. The task force, led this year by the landing ship dock USS Ashland, mirrors in scope to another U.S. Naval Forces Europe/6th Fleet-led initiative dubbed Africa Partnership Station. That effort works with 14 West and Central African countries to teach similar maritime security initiatives. The Southeast Africa Task Force is about two years behind APS in terms of planning, carrying out missions and providing a “persistent presence” in African coastal waters. The Navy is experimenting with sea basing in the Gulf of Guinea to float outside any country of interest to the US. It’s official: The Pentagon formally announced Thursday that it is reestablishing an administrative entity called the Fourth Fleet — to oversee Navy vessels that sail the Caribbean, Central and South America. But the world is not standing still. India, South Africa, and Brazil are getting together to cooperate in Naval exercises. India is systematically targeting states that will bring India specific and tangible security and economic benefits. New Delhi, Apr 28 India is all set to expand its defence cooperation with more countries, with the forthcoming tri-lateral naval exercises between South Africa, Brazil and India next month. The inaugural IBSA (Indian-Brazil-South Africa) maritime exercise will take place off Simonstown May 2-16. This is part of a package of measures announced after the second IBSA summit of the heads of state of the three countries in Pretoria, in October last year. Bush/Cheney have severely weakened the US. Trying to rule the world with an iron fist, even with occasional bits of velvet on, won’t work. The world has other ideas. The IBSA countries all enjoy friendly relations with the US. Yet obviously they see a need for military alliances that do not include the US. The US can cause, and in many places already is causing enormous suffering, without much in the way of positive results. Other approaches to US needs and wants are certainly possible, probably more effective, and unfortunately unlikely anytime soon. And of course, if anyone is actually interested in democracy, strengthening political and diplomatic institutions is the way to go, not increased militarism. GULF OF GUINEA (March 18, 2008) Lt. Cmdr. 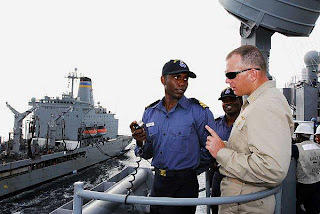 Thomas Kait, executive officer of the amphibious dock landing ship USS Fort McHenry (LSD 43) teaches procedures for underway replenishment to Lt. Nsikan Friday and Lt. Mohamed Olanrewaju Zubair of the Nigerian Navy. The exercise to be conducted at the Western Naval Command’s area of responsibility, will focus on the Automatic Identification System aimed at enhancing Nigerian Navy’s capability to monitor vessel traffic in Nigerian waters. Abuja, Nigeria (April 16) – A French navy frigate is due in Nigeria Saturday on a five-day visit, just as a US warship arrived in the African nation for a week-long ‘transiting’ visit, PANA reported. The French warship – AVISO NAVY LIEUTENANT LE HENAFF – will arrive the commercial city of Lagos 26 April, and will conduct joint training exercises with the Nigerian Navy (NN). Earlier on Monday, US warship HSV SWIFT arrived Nigeria for a visit tagged “transiting the Gulf of Guinea.” The ship has already commenced a joint training exercise with the NN. Movement for the Emancipation of the Niger Delta, (MEND) has warned oil companies working along the coastal region of Nigeria to be ready for war, just as it said the military was not in a position to protect them. “MEND will offer materials such as explosives to communities that have now realised that it is better to destroy oil facilities in their territory since they do not benefit them in the first place. “On Thursday, April 17, 2008 at 2230 hours, commandos from the Movement for the Emancipation of the Niger Delta (MEND), sabotaged a major Shell Petroleum Company pipeline at Adamakiri in Rivers State of Nigeria. That pipeline crosses from the Cawthorn channel to Bonny,” the group said in an e-mail signed by Jomo Gbomo and sent to journalists. The group also said it provided logistics to the group that attacked a Chevron facility in Delta State on Thursday. Then finally, to show our way of saying “welcome” to the US Naval warship, USS Swift which is transiting the Gulf of Guinea. “Mr president, your warships do not intimidate us. Instead they only embolden our resolve in fighting the Goliaths of the world that support injustice. “We have nothing to loose because he that is down need fear no fall. Our waters and farms have been polluted by oil companies with double standards. Our girls are raped by soldiers of the Nigerian army with impunity and protesting youths are assaulted and killed daily. Even journalists from your country can not visit the region to report the truth without being arrested and embarrassed. Now some might try to make the argument that MEND is really just made up of “dead-enders” and greater US cooperation in patrolling the area would bring stability to the region. But wouldn’t a political solution to the Delta region be better than an intensification of the asymmetrical warfare between a larger patrol force (trained by the US) and MEND? And asymmetrical warfare is what AFRICOM is setting up to engage. Today the twelth annual United Nations Conference on Trade and Development convened in Accra. The theme is Addressing the opportunities and challenges of globalization for development. At a press briefing on his arrival, the UN Secretary-General noted that the current food crisis that threatened the world, had dire consequences, especially for the developing world, adding that, the conference would take a serious look at the situation and how best to deal with it. He said another issue that needed to be examined was the current trend of trade liberalisation and its impact on developing countries. Speaker of Parliament, Mr Ebenezer Begyina Sekyi Hughes … said trade, democracy and development were linked in the modern era of globalisation, but noted that “for a number of years now, the inputs of the Legislature, which is the microcosm of the people, have been left out during global discussions on trade and development”. Mr. Hughes said the trend was slowly, but hopefully changing, and representatives from the Legislature were now being involved in some of these discussions. Unfortunately, leaving out legislatures and other organizations that gather and express the views of broad cross sections of people has been the practice in far too many countries. I hope that the conferees at UNCTAD will pay attention to the conversations and conclusions of the IAASTD, International Assessment of Agricultural Science and Technology for Development. IAASTD concluded a three year study in South Africa last week. “The question of how to feed the world could hardly be more urgent,” said Robert Watson, director of the IAASTD and chief scientist at the British environment and agriculture department. The IAASTD brought together more than 400 scientists who examined all current knowledge about agricultural practices and science to find ways to double food production in the next 25 to 50 years and do so sustainably, while helping to lift the poor out of poverty. They concluded that the way to meet these challenges is through combining local and traditional know-how with formal knowledge. The effort produced five regional assessments and a synthesis report, as well as an executive summary for decision makers. Representatives from 30 governments of developed and developing countries, the biotechnology and pesticide industry and a wide range of non-governmental organisations (NGOs), including Greenpeace and Oxfam, were involved. Public sessions were also held to gather input from producer and consumer groups, as well as others within the private sector. However, last year the two biggest biotech and pesticide companies, Syngenta and BASF, along with their industry association — Crop Life International — abandoned the assessment process. This was on the grounds that the final draft of the synthesis report was overly cautious about the potential risks of genetically modified crops, and sceptical of the benefits. Graphic: yellow is demand, green supply. The combination of rising demand, the emergence of powerful new energy consumers, and the contraction of the global energy supply is demolishing the energy-abundant world we are familiar with and creating in its place a new world order. Think of it as rising powers/shrinking planet. This new world order will be characterized by fierce international competition for dwindling stocks of oil, natural gas, coal and uranium, as well as by a tidal shift in power and wealth from energy-deficit states like China, Japan and the United States to energy-surplus states like Russia, Saudi Arabia and Venezuela. In the process, the lives of everyone will be affected in one way or another – with poor and middle-class consumers in the energy-deficit states experiencing the harshest effects. That’s most of us and our children, in case you hadn’t quite taken it in. Intense competition between older and newer economic powers for available supplies of energy. Until very recently, the mature industrial powers of Europe, Asia and North America consumed the lion’s share of energy and left the dregs for the developing world. . . . But that ratio is changing . . . In this new stage of energy competition, the advantages long enjoyed by Western energy majors has been eroded by vigorous, state-backed upstarts from the developing world. The insufficiency of primary energy supplies. By all accounts, the global supply of oil will expand for perhaps another half decade before reaching a peak and beginning to decline, while supplies of natural gas, coal and uranium will probably grow for another decade or two before peaking and commencing their own inevitable declines. In the meantime, global supplies of these existing fuels will prove incapable of reaching the elevated levels demanded.
. . . So expect global energy shortages and high prices to be a constant source of hardship. The painfully slow development of energy alternatives.
. . . alternatives, which now contribute only a tiny percentage of the world’s net fuel supply, are simply not being developed fast enough to avert the multifaceted global energy catastrophe that lies ahead. In global warming terms, the implications are nothing short of catastrophic: Rising reliance on coal (especially in China, India and the United States) means that global emissions of carbon dioxide are projected to rise by 59% over the next quarter-century, from 26.9 billion metric tons to 42.9 billion tons. The meaning of this is simple. If these figures hold, there is no hope of averting the worst effects of climate change. When it comes to global energy supplies, the implications are nearly as dire. To meet soaring energy demand, we would need a massive influx of alternative fuels, which would mean equally massive investment – in the trillions of dollars – to ensure that the newest possibilities move rapidly from laboratory to full-scale commercial production; but that, sad to say, is not in the cards. Instead, the major energy firms (backed by lavish US government subsidies and tax breaks) are putting their mega-windfall profits from rising energy prices into vastly expensive (and environmentally questionable) schemes . . . In the case of oil and natural gas, the major energy-surplus states can be counted on two hands. Ten oil-rich states possess 82.2% of the world’s proven reserves. In order of importance, they are: Saudi Arabia, Iran, Iraq, Kuwait, the United Arab Emirates, Venezuela, Russia, Libya, Kazakhstan and Nigeria. The possession of natural gas is even more concentrated. Three countries – Russia, Iran and Qatar – harbor an astonishing 55.8% of the world supply. All of these countries are in an enviable position to cash in on the dramatic rise in global energy prices and to extract from potential customers whatever political concessions they deem important. The transfer of wealth alone is already mind-boggling. Russia is now the world’s leading supplier of natural gas, the second largest supplier of oil and a major producer of coal and uranium. Though many of these assets were briefly privatized during the reign of Boris Yeltsin, President Vladimir Putin has brought most of them back under state control – in some cases by exceedingly questionable legal means. A growing risk of conflict. Will energy-deficit states launch campaigns to wrest the oil and gas reserves of surplus states from their control – the George W Bush administration’s war in Iraq might already be thought of as one such attempt or to eliminate competitors among their deficit-state rivals? The high costs and risks of modern warfare are well known and there is a widespread perception that energy problems can best be solved through economic means, not military ones. Nevertheless, the major powers are employing military means in their efforts to gain advantage in the global struggle for energy, and no one should be deluded on the subject. One conspicuous use of military means in the pursuit of energy is obviously the regular transfer of arms and military-support services by the major energy-importing states to their principal suppliers. Both the United States and China, for example, have stepped up their deliveries of arms and equipment to oil-producing states like Angola, Nigeria and Sudan in Africa and, in the Caspian Sea basin, Azerbaijan, Kazakhstan and Kyrgyzstan. The United States has placed particular emphasis on suppressing the armed insurgency in the vital Niger Delta region of Nigeria, where most of the country’s oil is produced; Beijing has emphasized arms aid to Sudan, where Chinese-led oil operations are threatened by insurgencies in both the South and Darfur. In this new world order, energy will govern our lives in new ways and on a daily basis. It will determine when, and for what purposes, we use our cars; how high (or low) we turn our thermostats; when, where, or even if, we travel; increasingly, what foods we eat (given that the price of producing and distributing many meats and vegetables is profoundly affected by the cost of oil or the allure of growing corn for ethanol); for some of us, where to live; for others, what businesses we engage in; for all of us, when and under what circumstances we go to war or avoid foreign entanglements that could end in war. This leads to a final observation: the most pressing decision facing the next president and Congress may be how best to accelerate the transition from a fossil-fuel-based energy system to a system based on climate-friendly energy alternatives. I recommend you read the entire article. This is the world we are living in. Voting, and how we vote in each and every election where we can vote is critical. These facts do not bode well for democracy anywhere. According to the Pentagon, AFRICOM has been created in recognition of Africa’s global importance and is intended to allow the United States to bolster African security, enhance strategic cooperation, build partnerships, and support humanitarian missions.
. . . the military bias will, as in the past, contribute to human rights abuses and ongoing conflict rather than promoting security based on African needs. 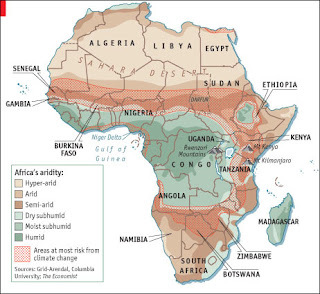 In the 1980s Reagan and Brezhnev saw Africa as a place where they might play their cold war power games with little or no risk, resulting in arms races and proxy wars. Their rivalries displaced millions of Africans, resulting in burned homes, sadistic punishments, including dismemberment, and mass murder. The results of those policies continue to the present. Increased militarization is the problem, not the answer. Whoever created the logo must have realized what it looks like. I’ve played around a bit with art and design, and I don’t think it is possible to do that and miss the connection. A casual observer might miss it, but I don’t think it is possible for the artist to miss the implications. Whether subliminal or conscious, like b real said – it speaks volumes about their intentions. The ‘Khama Agenda’ consists of three major parts: to decimate his enemies within the party and consolidate his power, to replicate the same on a national level and ultimately leave a legacy worthy of the expectation that surrounded his ascendance to the national stage. Ian Khama’s (presidency will be) a much more authoritarian, paranoia-riddled and anti-democratic era. Khama ascended to the presidency by means of Botswana’s practice of automatic succession. He was Vice President, President Mogae retired, and Khama became president. He has never run for office, and never won a democratic election. “He has done on and off training in very challenging areas of the military. He has had some training with almost all the major intelligence organizations. The BDF, at least at the intelligence level is much closer to the Americans and Israelis so Ian would have done a number of programs in the intelligence arms of those countries” explains the source. Military men love loyalists and Khama has surrounded himself with loyalists . . .
A Botswana Directorate of Intelligence and Security was recently legislated, and is largely seen as the work of Ian Khama. However critics . . . noted that it gave too much power to the president and everyone else appointed by the president, the Minister, the Commanders of BDF and Commissioner of Police, and yet possessed no oversight provision. Also according to the article, Khama is very much obsessed with intelligence, and wants to know what is going on with everyone everywhere. It is apparent he has already used intelligence gathering to help him consolidate his power within the party, and also the nation. At the same time BDF officers started cropping up in senior positions in the public service. There has been more overt appointments like Isaac Kgosi’s appointment as Senior private Secretary to the Vice President. Part of the core Khama contingent that Khama brought from the BDF Kgosi occupies a special position in Khama’s books. “At the government enclave, word has it that Kgosi is in reality more powerful even than the PSP himself. As the man who has access to the nerve centre of government, he has much more power than officials care to admit. To the public and everybody, he is the only bridge to the Vice President – the man seen by cynics as the de facto president” wrote Mmegi. Kgosi is said to be poised to become the Director of that important Directorate of Security and Intelligence. “Khama is a man who likes to follow everything to its last detail, and that’s why he likes Intelligence. He keeps records of everything that he thinks is important. He has a theory that says, ‘intelligence everywhere’, in other words, if the BCP has a central committee meeting somewhere in Shakawe, if we do not have an officer there we better have an informant there” says an inside source. Khama is a military man who likes military toys and technology. He values secrecy, “intelligence”, and unquestioning loyalty. Khama was a soldier from his teenage years. His major education came from the army. And his history in the party shows a man orientated in the military approach to things. In the army, there is discipline and order that is followed by all. This is the language that Khama understands. Khama is a man with a burden. His burden is the expectations surrounding him. For that reason Khama’s failures, when they do occur, stand to be spectacular. That may be an incentive for the opposition too. By choosing to concentrate on opposition-held constituencies Khama is making an assumption that the opposition is not a strong challenger in BDP-held constituencies. This could prove disastrous. However, a person obsessed with gathering “intelligence”, the means to gather that “intelligence”, free of oversight, and willing to use it for political purposes, can be a formidable anti democratic force. Khama is a military man and speaks the military language. He has obviously had extensive contact with US military, as well as being trained in the UK. He will be very comfortable with the military leadership running AFRICOM, which will find his friendship, his country, and its strategic resources to be a valuable ally. 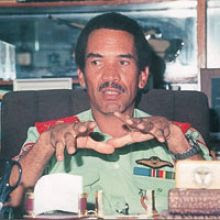 Khama is credited as the man behind Thebephatshwa air base. The exact connection between US activities and Thebephatshwa are unclear, but the articles I’ve cited indicate that Khama’s preference for secrecy is part of the reason for that lack of clarity. With South Africa so clearly opposed to AFRICOM, gradually working towards making Thebephatshwa into a regional hq for US interests should be a very attractive possibility for the military leadership of AFRICOM. There is nothing in any of this that will help foster democracy. Military language is not the language of democracy. Military structure and heirarchy is not democratic. A democratic government needs to listen to a broad spectrum of society, not just the most loyal and unquestioning followers. If Botswana is going to preserve democracy there will need to be effective opposition to Khama’s initiatives along the way. And Khama shows no ability to compromise, or willingness to yield or lose. Botswana is on an electrical power tightrope. If the country is very lucky, it may move forward relatively unscathed. But if the power starts going out, business suffers, safety suffers, and the people become unhappy. That would be a major test for Botswana’s democracy. If there is a major democratic upheaval in Botswana, who will AFRICOM support and enable? Will it be a military colleague, or a democratic process it is not designed to encourage or advantage?